American Philatelic Society president Mick Zais (left) presents the 2017 single-frame Champion of Champions award to exhibitor Michael T. Mahler for his exhibit of high-denomination Civil War-era revenue stamps on original documents. Mahler’s exhibit includes the only recorded example of the 1871 $500 second-issue revenue stamp, known as the “Persian Rug,” on an original document. The exhibit “Big Rug, Small Rug, Baby Rug: U.S. Civil War Era $200 and $500 Revenues, Their Purpose Illustrated” won the 2017 single-frame Champion of Champions award for revenue stamp specialist Michael T. Mahler. His win was announced during the March 4 awards banquet at the American Philatelic Society’s 2017 Ameristamp Expo in Reno, Nev. The winner was chosen from among 21 exhibits that received single-frame grand awards from APS national shows over the past year. Mahler’s exhibit qualified for the annual competition with a single-frame grand award win last September at Sescal 2016, the annual stamp exhibition sponsored by the Federated Philatelic Clubs of Southern California. His “Big Rug, Small Rug, Baby Rug” exhibit focuses on the U.S. $200 and $500 revenue stamps of the Civil War on original documents. The stamps were created and used to facilitate payment of particularly large taxes. A longtime collector’s No. 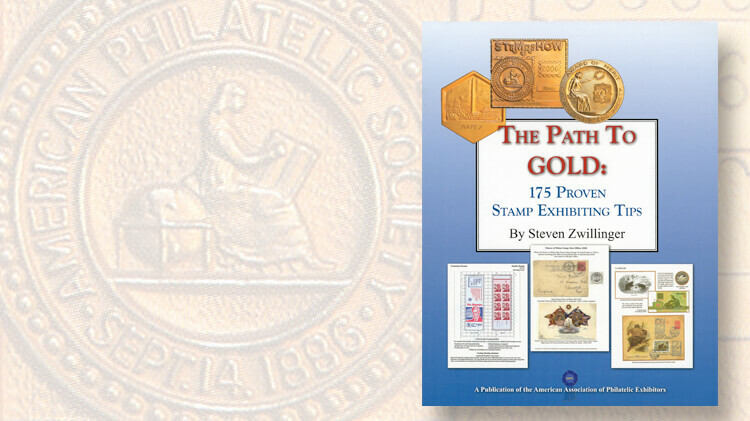 1 tip to prospective stamp exhibitors: Steven Zwillinger is a longtime exhibitor who has won numerous gold medals for his exhibits of India and Burma. He also is an accomplished writer. Significant increases in those taxes during the war resulted in the printing of the 1864 $200 first issue revenue stamp (Scott R102), which is shown on deeds and mortgages in Mahler’s exhibit. These were followed in 1871 by the $200 “small rug” second issue (R132) and the tricolor $500 stamp known as the large “Persian Rug” — the “big rug” — for its intricate and colorful design (R133).